A getaway or a scouting trip? To my mind, that fine distinction is in the eye of the beholder. 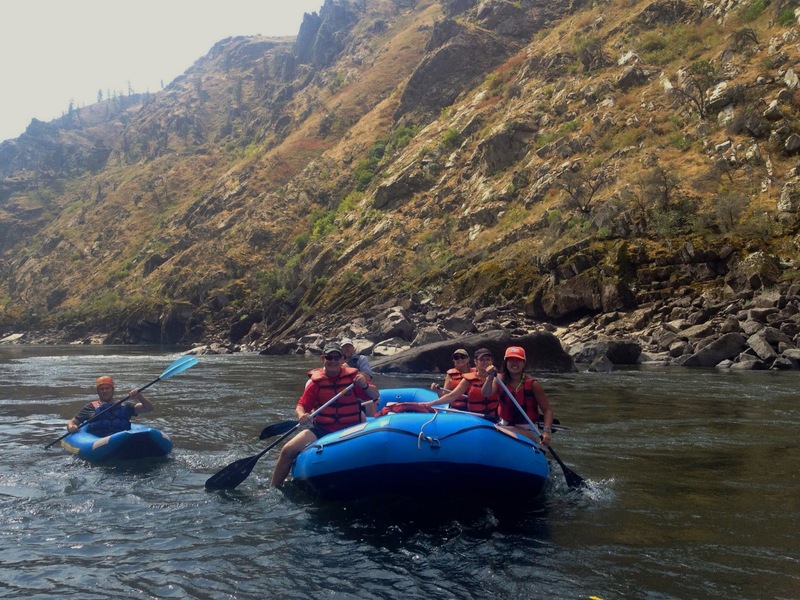 Six months ago, a friend of ours said we needed to do a rafting trip in Idaho to see the country and get out of the east coast malaise of August. In case you don't know, I hate August. I have no use for a hot month, outside of bird season, full of ticks, thunderstorms and cutting grass. "This is a trip like no other!" she said. "Whatever." I replied. We signed up, along with 30 other folks from this area. Along the way, all but 5 hardy individuals dropped away citing school openings, weddings, deaths and dogs eating homework. Ultimately, we boarded the Delta jet and looked ahead to seeing another part of the country- the Salmon and Snake Rivers and Hells Canyon in Idaho. 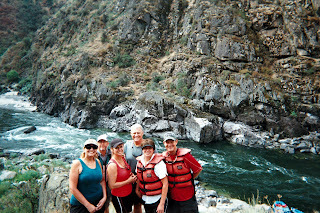 The crew and guide above the rapids. We arrived in McCall, ID, at one time a logging and ranching town in northwest Idaho now a welcoming, pleasant vacationing spot in the mountains. Situated on a large lake, McCall has plenty of nice eateries, stores and even an indoor hockey arena. For example, we ate at Romano's, an Italian restaurant on the lake. The waitress greeted us with, "I hope you are hungry!". The food was great and served promptly, and it complemented the incredible view across the lake to the mountains. That evening at 8:30pm, we met our crew: +Tricia Warren, owner, guide, and river boss, and Brad, Cori and Glen. We were given dry bags to hold our gear and agreed to meet at 7:30 am the next morning ready for an adventure! The company is +North Star Expeditions based in McCall and they specialize in guided, multi-day rafting trips down the Salmon and Snake Rivers, through Hell's Canyon. 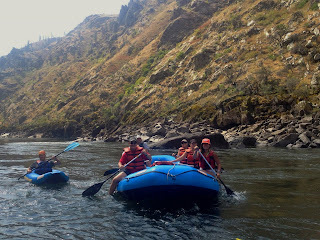 In addition, they also guide "cast and blast" trips down the Snake River, through Hell's Canyon. After a couple hour drive to the "put in", we loaded onto the paddle boat with Glen as our guide. In addition, Tricia and Teresa were in another, bigger "oar boat" and Brad and Cori took an additional oar boat with all our supplies and camping paraphernalia on board. Brad and Cori took off ahead of us in order to secure a good campsite alongside the river. We would meet them around 5 pm. for dinner. While we were running rapids and exploring, they were setting up camp, tents, cooking, etc. The first day, we stopped at an archaeological dig manned by students from Oregon State University (Go Beavers!). Then it was on to numerous Class I through Class IV rapids. I may be wrong, but I think there may have been one Class V in there, or maybe the classification changed to a higher one during the Spring rains when the rivers are up and really flowing. During the float, Glen and Brad kept pointing out Chukar noises along the river. Finally, I heard the little rascals! Then, we started seeing them. Group after group, the birds would be "chuk, chuk, chuk"ing away on the side of the hills, then come down to water. Probably never bothered by a man or dog, they were totally unimpressed with our little armada. The guides told me about the "Cast and Blast" trips they offer in late September and early October. They guide down the Snake River and fish and hunt Chukar and Hungarian Partridge (Huns). Given the numbers of birds I saw, that could be a nice trip. You would take your own dog, gun, etc., but the guides can take their own dogs, as well. I was unavailable for that time frame, but I think it might be an awesome trip! Each evening, around 5 pm, we drifted in to the the campsite Brad and Cori prepared for us. We cleaned up, dressed in dry clothes and commenced to tell some tall tales about this event or that rapid. Our tents (all gear supplied by North Star) were set up already and all we had to do was pick one and get in. 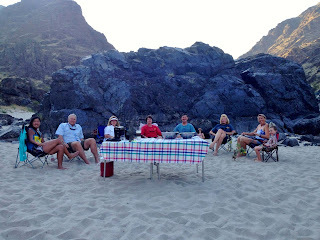 Plenty of tall tales got told- cliff diving, water wars, archaeological sites, historical legends, etc. Then the food was brought in from the dutch ovens, River Potatoes, Pineapple Upside Down Cake, grilled steaks, grilled salmon, grilled vegetables, corn on the cob, fresh salads, etc. After 4 days and 3 nights on the Salmon and then, Snake, Rivers, we arrived at Heller Bar, take out point in Asotin, WA. At this point, the Snake River is the boundary between Washington and Idaho. We got out on the west bank in Washington. At one point, we were in Idaho, Oregon and Washington states, all on one trip. We saw Chukar, Bald Eagles, hawks, Big Horn Sheep and lots of Smallmouth Bass. Salmon still run up these rivers and their numbers are on the rise, but the first run of the year was over and the second not yet started, so we missed seeing them. Plenty of wildlife! Would I do this trip again? Yes. I would pick another section of the rivers, and I may just do the Cast and Blast one year. If this trip is any indication of the way North Star takes care of their customers, I'm 100% in favor of another trip.